Residents of Colonia Forjadores in Playa del Carmen, denounced through social networks a man apparently of foreign origin, who at night goes out with a firearm to shoot street dogs (or at least tries to). 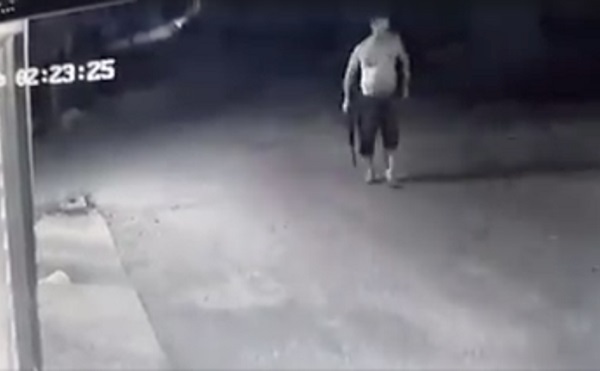 In the footage posted on social networks, the subject can be seen walking the streets at night, with a shotgun in his hand, pointing at the animals. However, it is said that so far he has not been able to terminate any dogs due to his lack of skill in handling weapons. The man can be seen walking the streets of Colonia Forjadores with a long weapon in his hand, followed by a woman who according to Canal 10 is his wife. The director of the Municipal Animal Welfare Center (Cebiam) in the municipality of Solidaridad, Claudia Sánchez said that local authorities are already aware of this situation. Although, she also specified that the case corresponds to Public Security and Migration, since this mn is armed and dangerous and besides he is not a national. However, the municipal official asked the citizens to report any case of animal cruelty before the corresponding authorities.